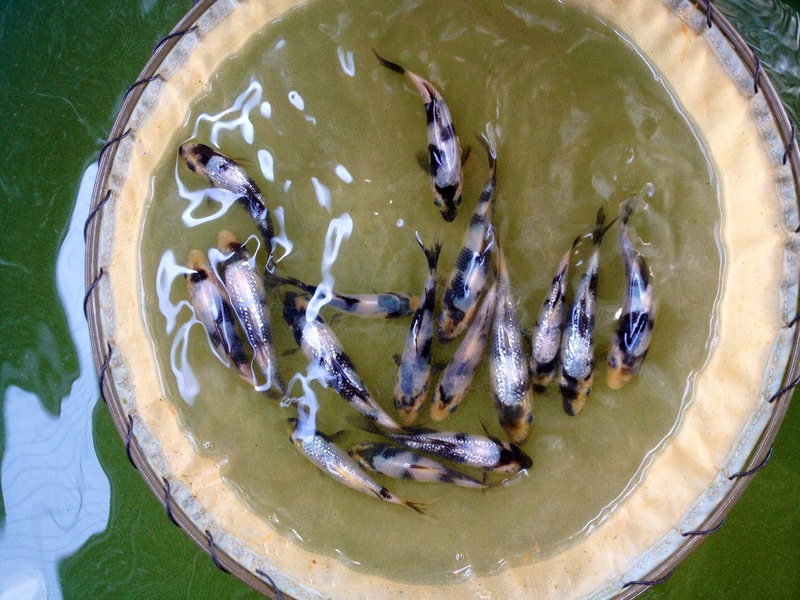 Marugen Koi farm is pleased to showcase pictures and video clip of Black Beauty’s offspring, a baby tancho showa koi fish, now at 1.5 months old. 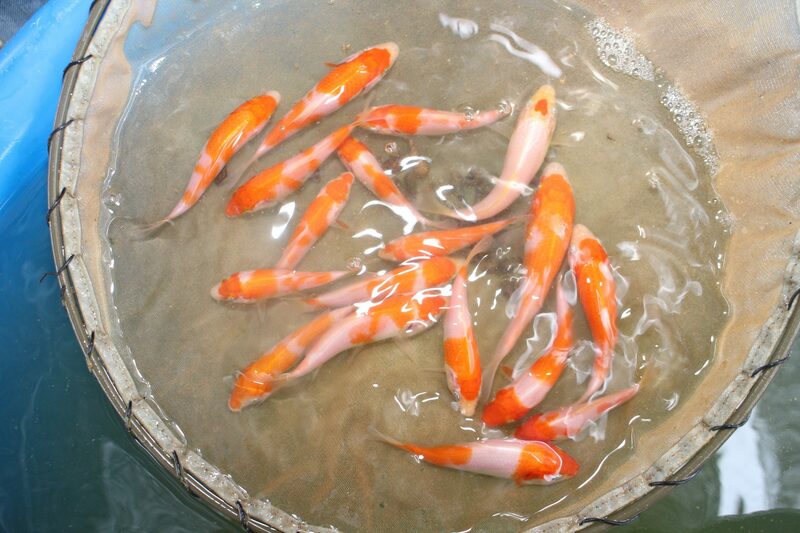 Marugen Koi Farm is pleased to post an update on the offsprings of “M Tanchozuru”. 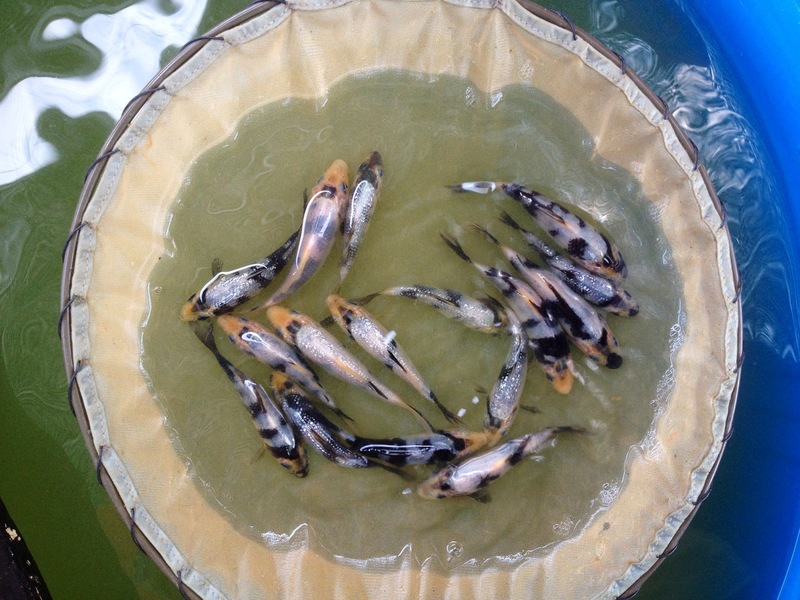 These baby koi fries are now 10 days old, and are eating well and growing healthily in the mud pond. 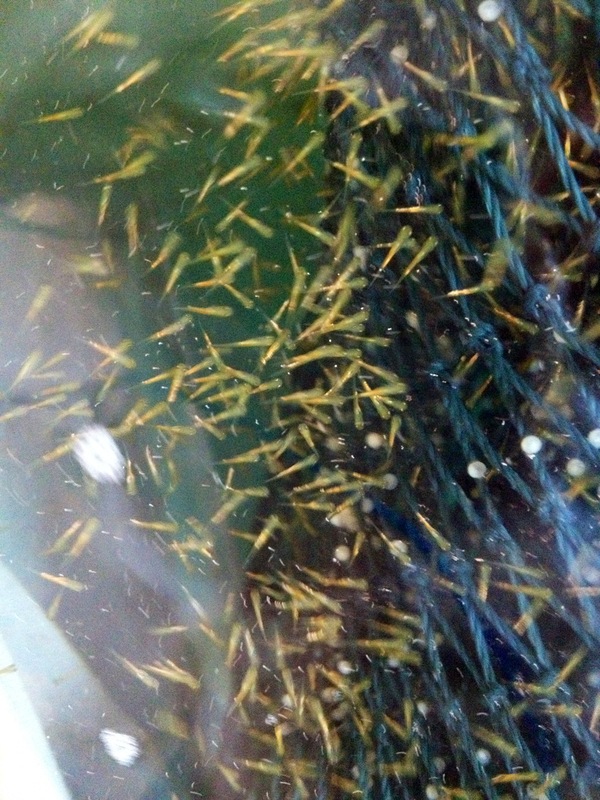 Marugen Koi Farm is pleased to post an update on our baby koi fries on the 2nd day of hatching. 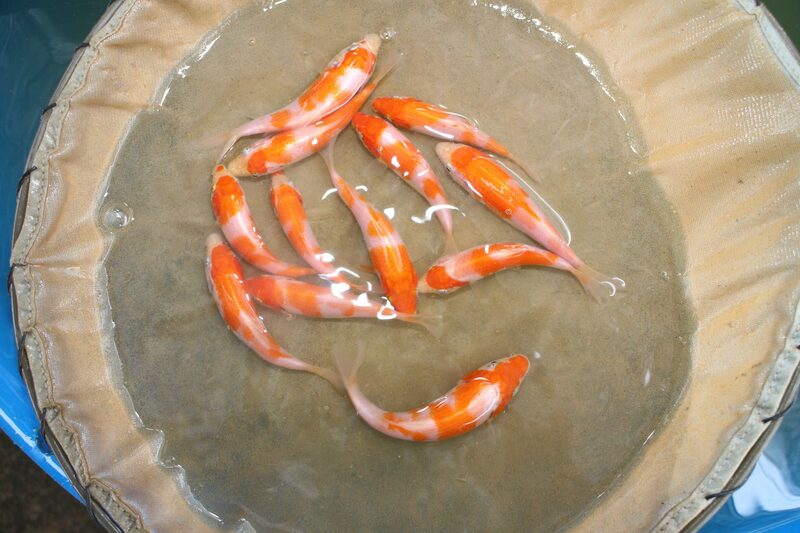 The baby koi fries are offsprings of “M Tanchozuru“, a beautiful and snow white Tancho Kohaku, bred by the world renowned Japanese Koi breeding farm, Sakai Fish Farm. High hopes will be expected from these baby koi fries. 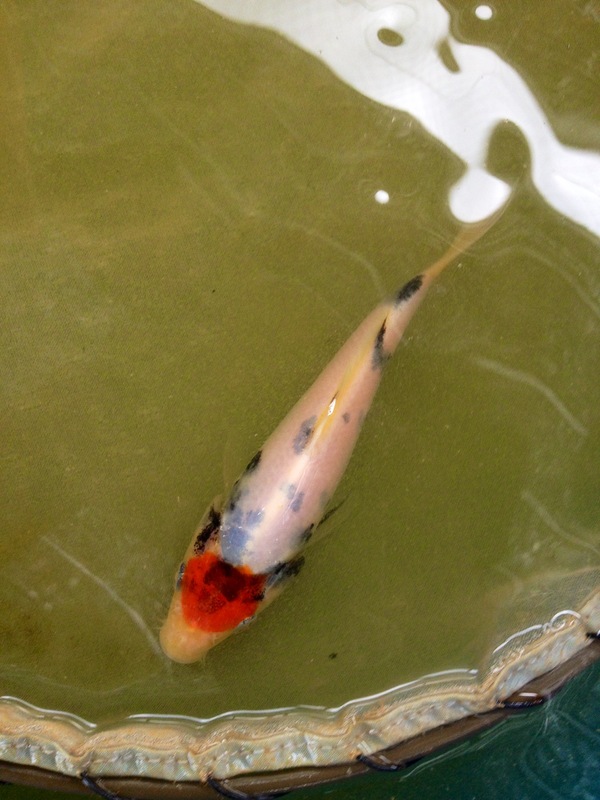 Click here to see “M Tanchozuru”, Marugen Koi Farm’s new female oyagoi, along with the other male parent koi fishes. 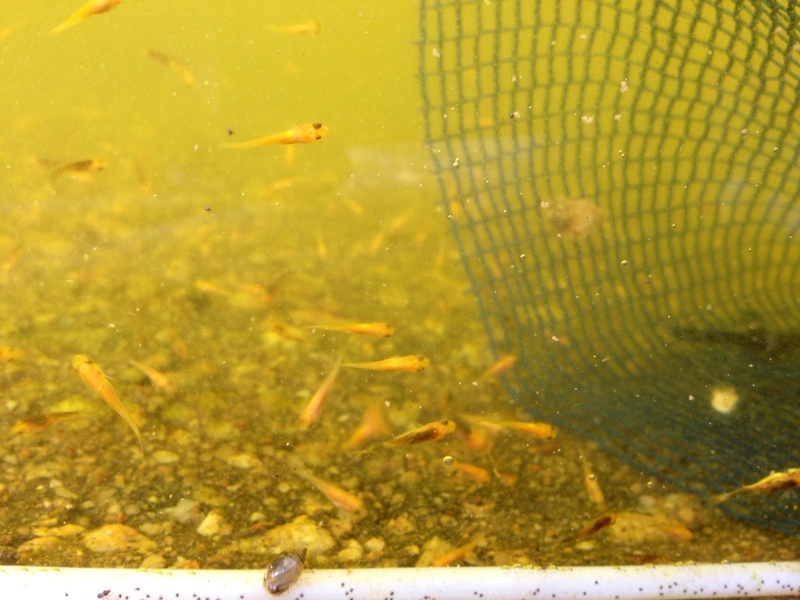 Here is a video of M Tanchozuru’s baby koi fries, taken in the spawning net, before they were released into the natural mud pond. 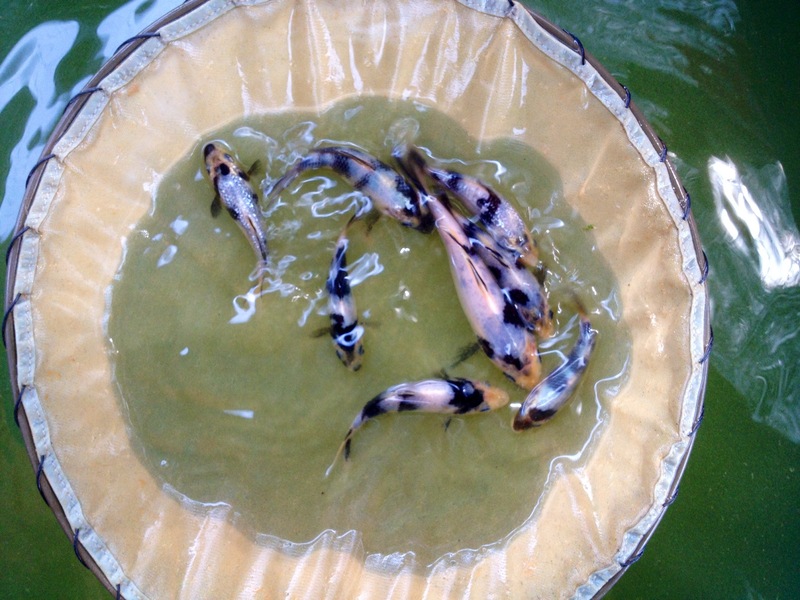 To ensure that the baby koi fries grow and develop well, Marugen Koi Farm feels that the natural habitat is the best bet, where ample food and natural nutrients and minerals are available. 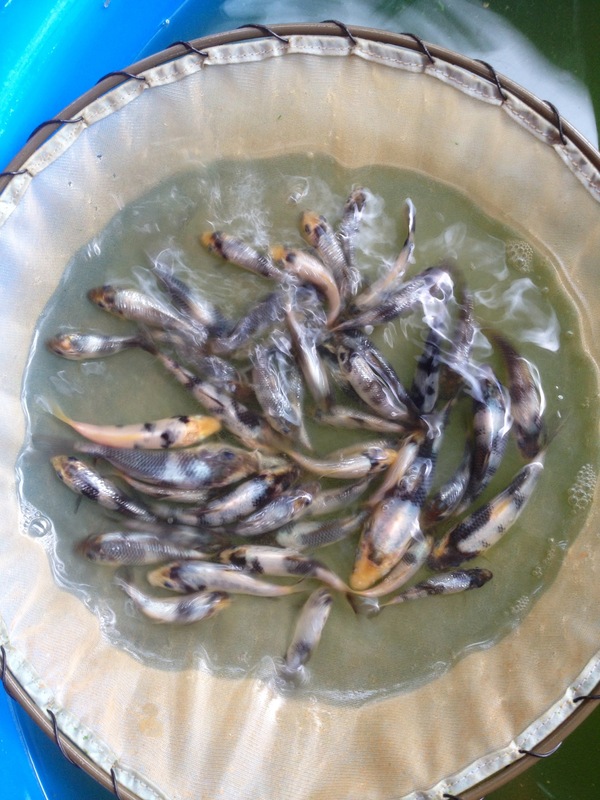 Hence, plans had been made for the baby koi fries to be released into the mud pond on the second day of hatching. 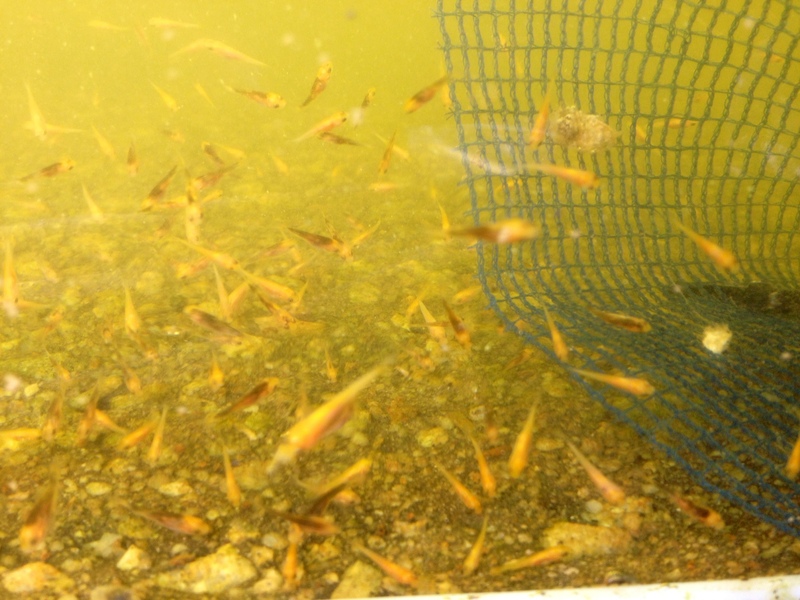 However, transferring newly hatched baby koi fries from the breeding net into the mud pond is a very risky affair, as the baby kois are very fragile. It is like throwing a small little fish into the big Ocean. 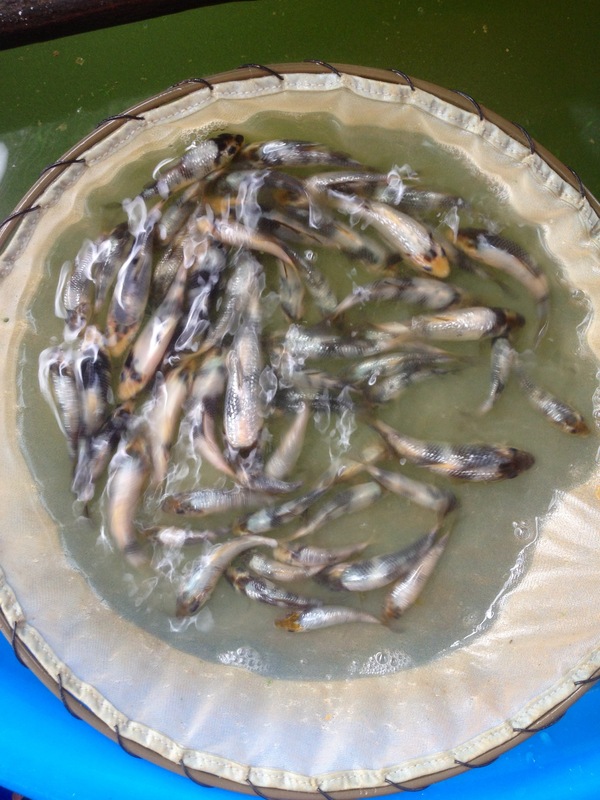 To add on, predators of baby koi fries, such as prawns, dragonfly nymphs, water spiders, water beetles and other carnivorous water insects are also co-existing naturally in the mud pond. 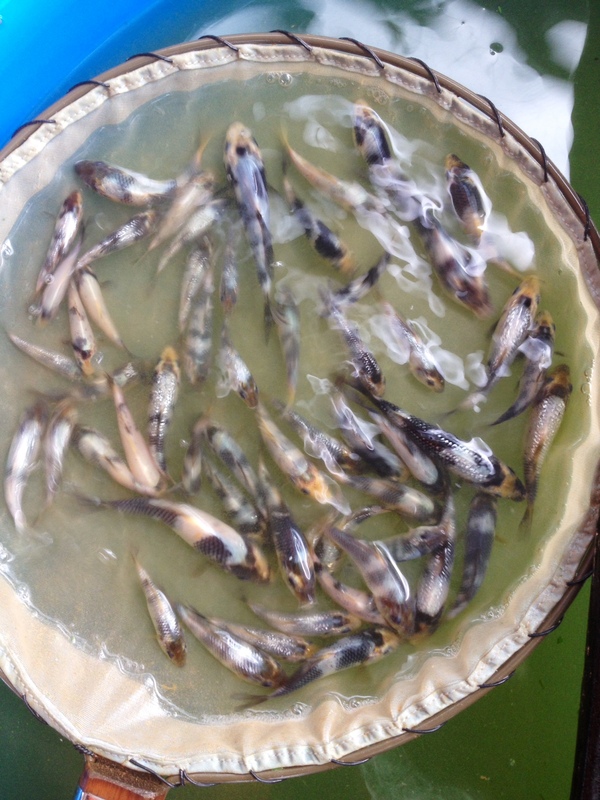 During this critical time in the mud pond, life and death of the baby koi fries very much dependant on their will and intelligence to survive the most dangerous & ordeal period of their life, at least for the next 2 weeks. 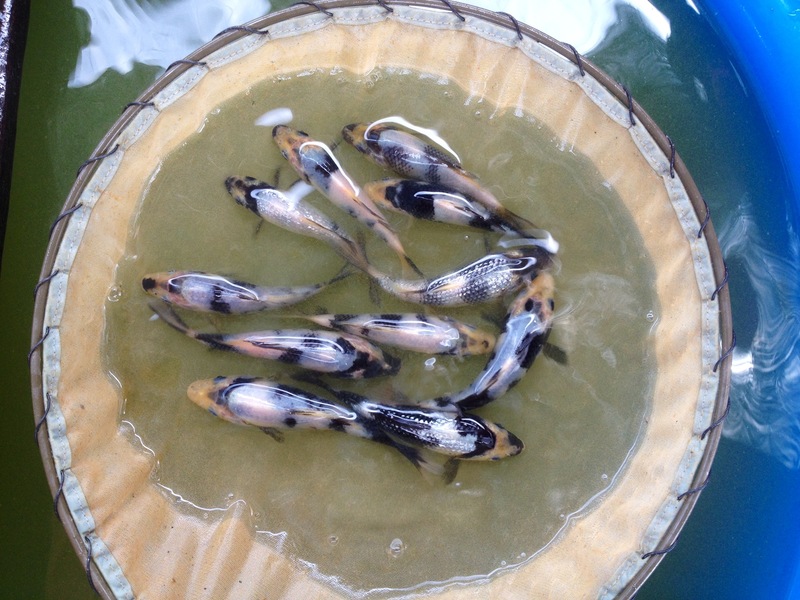 It is during this initial period that the baby koi fries will eat as much as possible, to grow as quickly as possible, so that they will outgrow, and no longer become preys of the predators, but themselves become the predator of their former predators (ie. 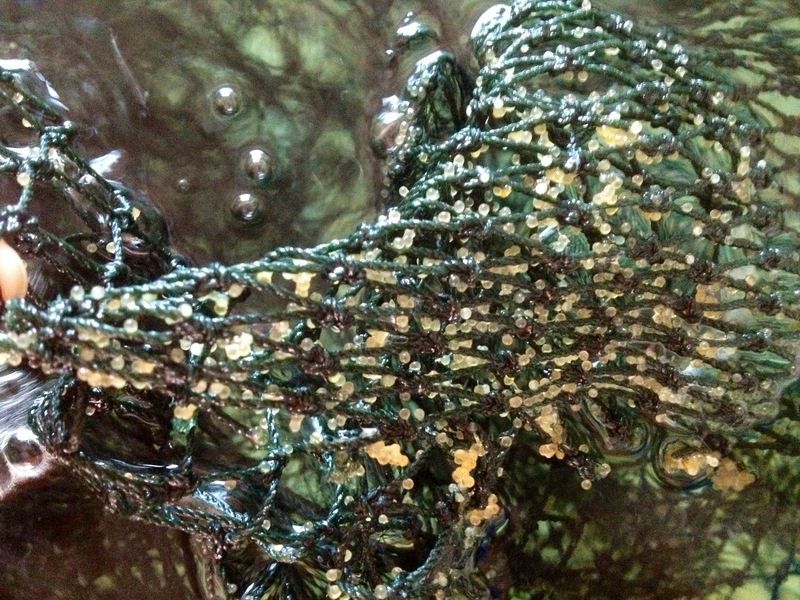 the water insects). 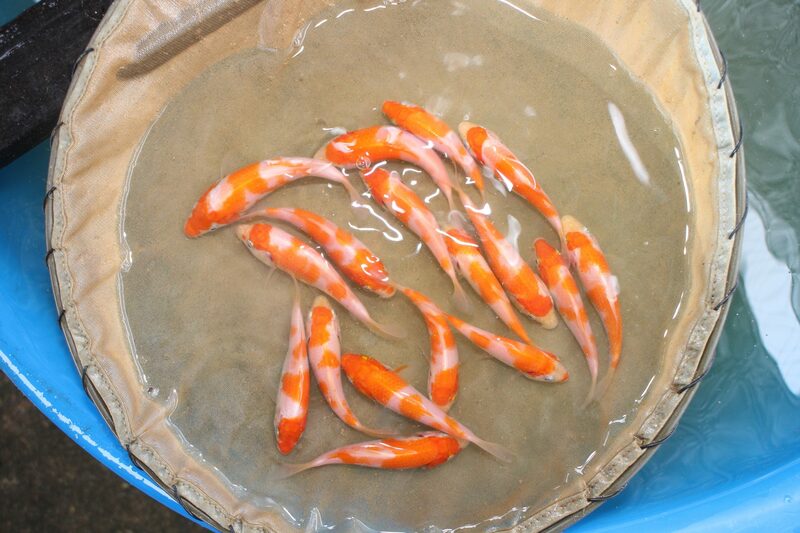 Here is a video of M Tanchozuru’s baby koi fries, after they have been released into the wild, the natural mud pond. 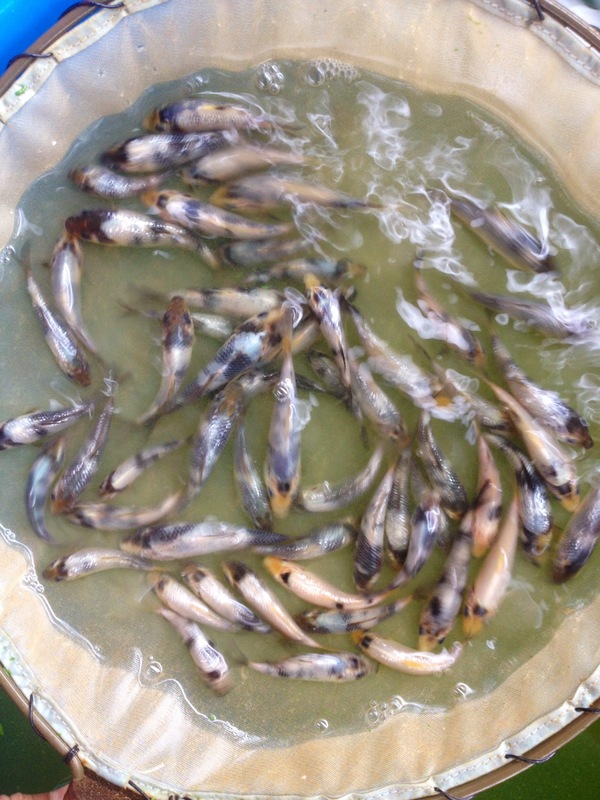 Now, these baby koi fries will have to fend for themselves, at least for the next 2 weeks. 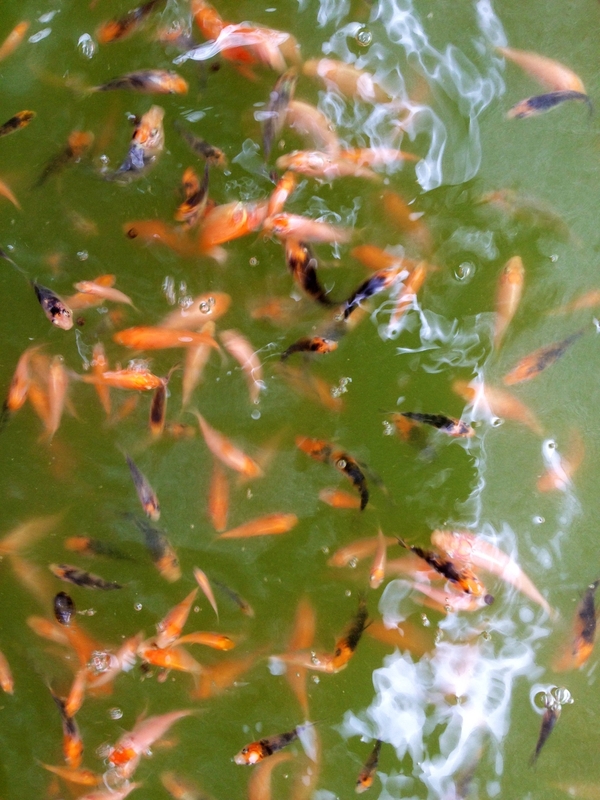 After that, new set of predators may come in, the free-flying birds feeding over the small koi fishes. 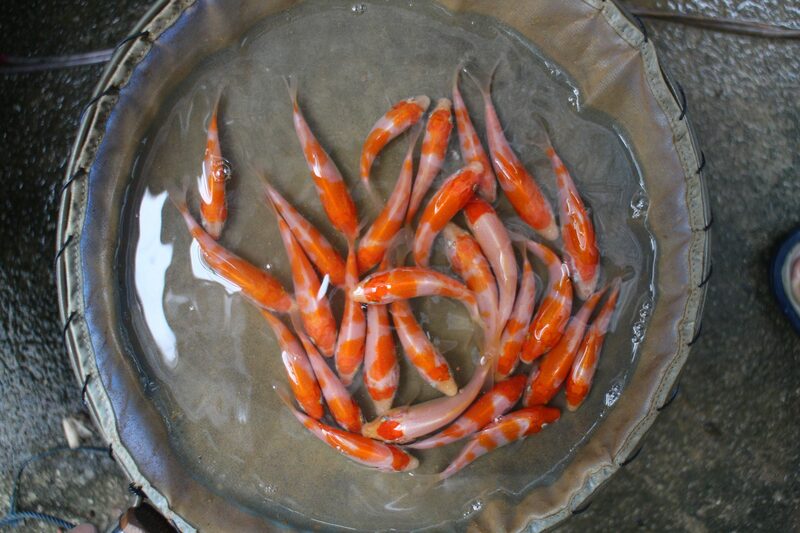 But let that worry come later, because now, the breeders at Marugen Koi Farm sincerely hope most of M Tanchozuru’s baby koi fries will survive the most difficult period of their growing stage, the initial 2 weeks! 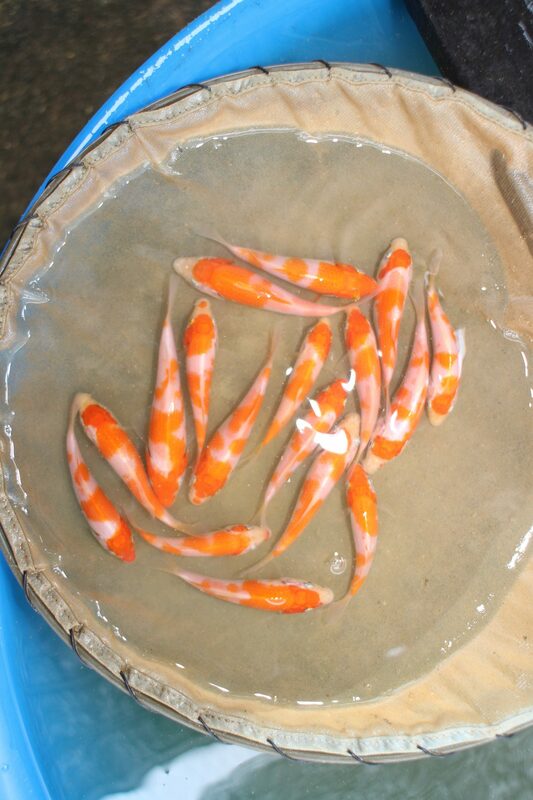 Marugen Koi Farm is delighted to update that the koi eggs spawned by our new female Oyagoi “M Tanchozuru“, has hatched. 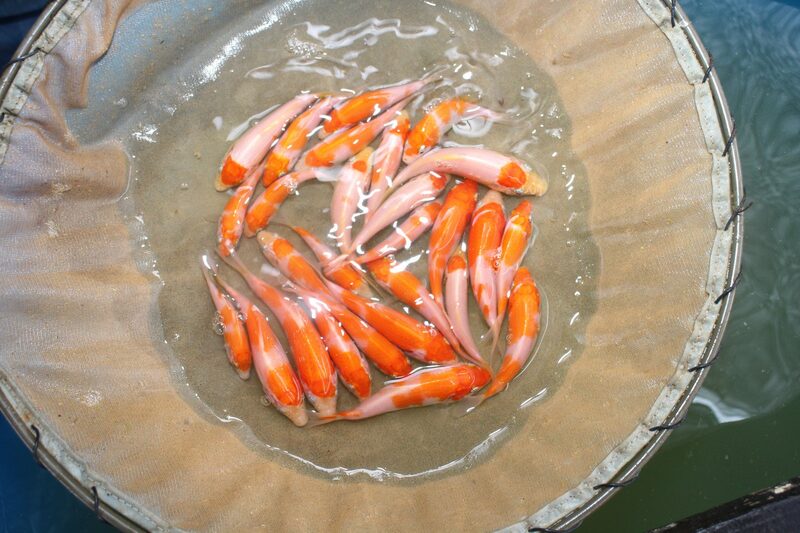 There are so many baby koi fries. 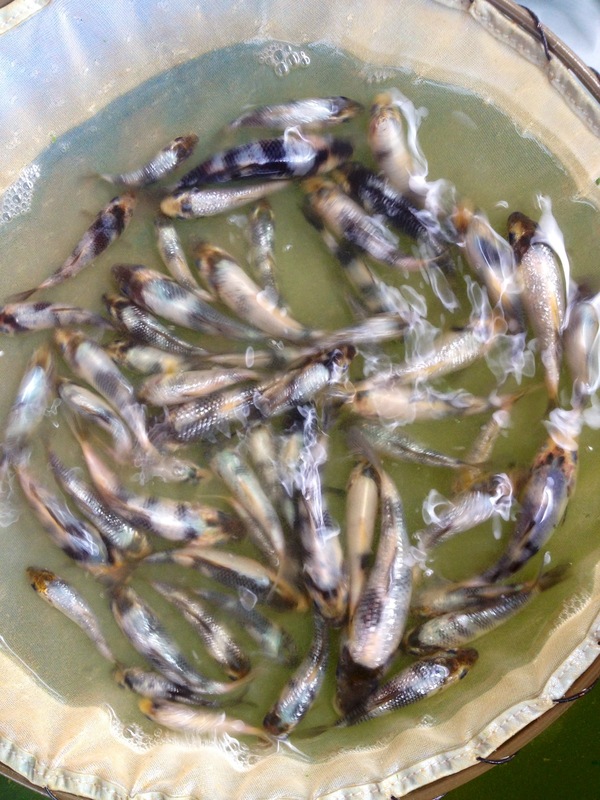 Now comes the hard work and patience to painstakingly nurture the baby koi fries. 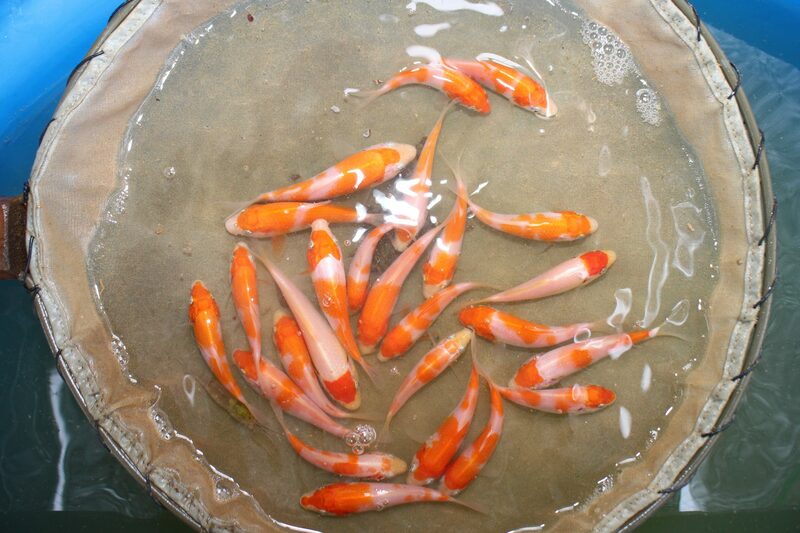 The first 2 weeks are the most vulnerable period for the baby koi fries, and a lot of time and loving care is required to ensure the safety of the baby koi fries. 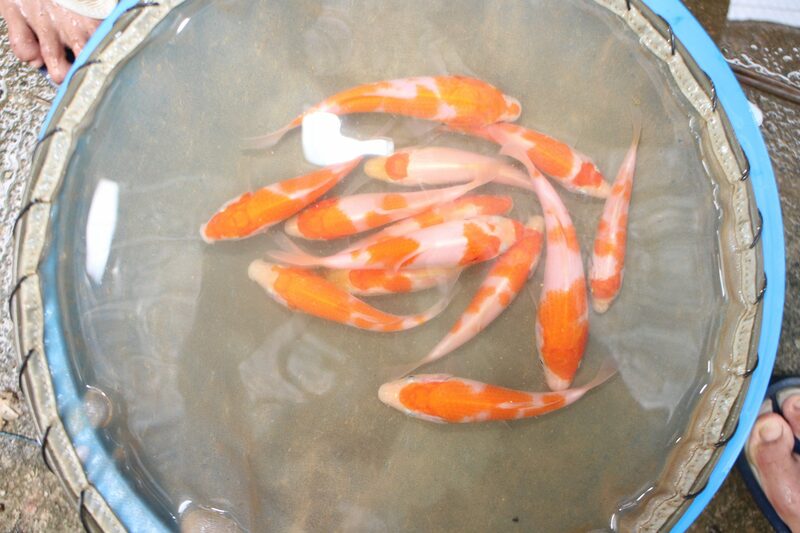 Click here to see “M Tanchozuru”, Marugen Koi Farm’s new female oyagoi, along with the other male parent koi fishes. 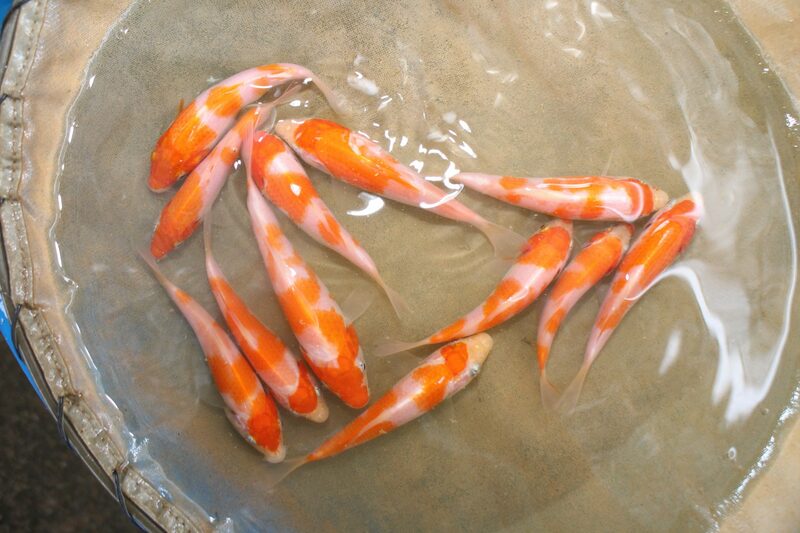 Marugen Koi Farm is pleased to present our new female oyagoi, a beautiful Tancho Kohaku, bred by Sakai Fish Farm. We call her “M Tanchozuru”, named after the graceful & exotic Japanese Red-Crowned Crane, a symbol of luck, longevity, immortality and fidelity in the Japanese and Chinese culture. 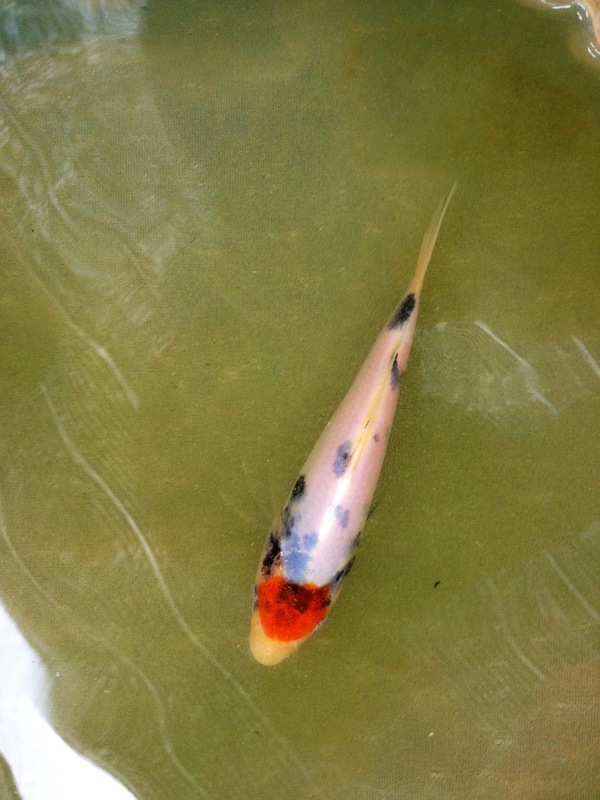 Marugen Koi Farm is delighted to share that our new female Oyagoi, “M Tanchozuru” has spawned. With her stunning quality (snow white skin, thick red beni & strong body), there is indeed high hopes for her babies.